I’m not sure if it’s the cool weather or approaching holidays, but I find myself making hearty meals from my childhood. Goulash was a staple in the Williams household, sometimes cooked on the stove top but best when baked in the oven. My mother’s recipe is not an authentic Hungarian goulash, so if that’s what you’re hoping for, you’ll be disappointed. My mother’s goulash is a bastardized version full of Midwestern touches like ground beef and elbow macaroni. Since I didn’t have all the necessary ingredients, my version is even further removed from the goulash family tree. But, it tasted good and was exactly what I needed. The weather is finally turning cold and rainy here in the northwest. The leaves are turning beautiful paprika-like colors and there is a constant chill in the air. This will be my first winter in Vancouver and I’m excited by the visible change in seasons (you don’t get this in California). As with the change in seasons, I find myself changing how and what I cook. I’m now drawn to baking casseroles and stews more than ever. I started preparing for dinner the other night by contemplating what to do with two pork chops. After a long walk in the park, I came home craving goulash. Sadly, I knew we were without the necessary ground beef and green peppers which made my mother’s recipe so good. The pork chops had to be used and I figured I could bend them to my will and force them into my goulash. I improvised on most ingredients, even the paprika, so my recipe is quite different from my mother’s. It turned out delicious so it’s good to know I can whip it up again with ingredients I have on hand. Heat a skillet over medium heat. When hot, add olive oil and turn skillet to coat. Place pork chops in skillet to brown for 1-2 minutes on each side. Season with salt as you flip the pork chops. Remove pork chops onto a plate and set aside. To the skillet, add the onion and saute until softened – 2-3 minutes. Add chives, black pepper, garlic powder, paprika, brown sugar, tomatoes (with juice), hot sauce and water. Stir and bring to a boil. Remove skillet from heat. Fold in the macaroni and top with the reserved pork chops. 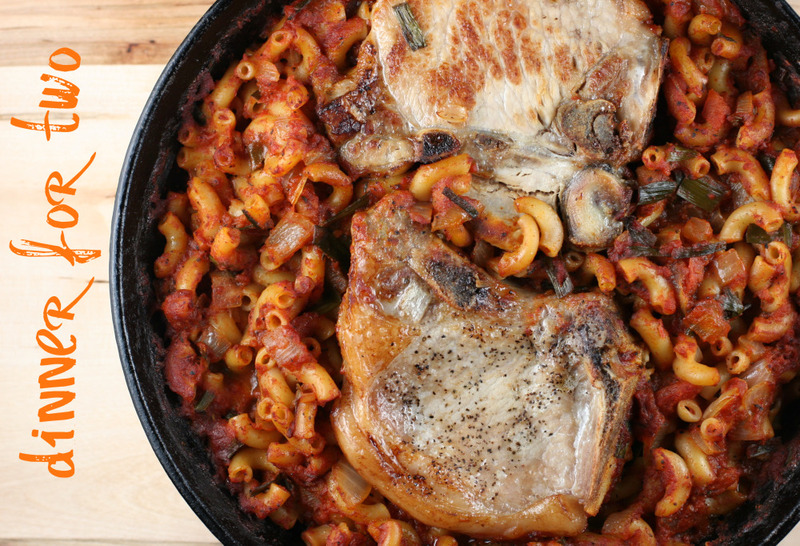 Place skillet into a 350F oven and bake for 50 minutes or until pasta and pork are done. During the final 10 minutes, check to see if any additional water is needed. If so, drizzle 1/4 cup over the top and continue baking until done. I didn’t have any smoked paprika so I substituted this also. In my spice drawer, I had a barbecue dry rub that was primarily composed of smoked paprika and brown sugar. I used 2 1/2 tablespoons of this mix in place of the paprika and brown sugar listed in the recipe. The baked goulash turned out slightly spicy, a little sweet, and smoky from the paprika. The macaroni absorbs all of the liquid while it bakes, so in the end it’s not soupy at all. And, it makes the perfect dinner for two. Delicious Allen! A real “winter warmer”…love the cast iron pan too! Yummy and very timely! I had just gotten out a couple of pork chops this morning and was deliberating on what to do with them. Grilling seemed so boring, even if I am in 70 degree, gorgeous Oklahoma where grilling outside is still very much an option, with picking up pecans while waiting for the grill to heat. Thanks, I’ll try this on my hubby tonight! I love goulash type dishes. My mother’s “American Chop Suey” is one of my favorites, although I’ve changed it quite a bit using fresh ingredients. Substituting ingredients can often times lead to the creation of a whole new dish. I love doing that. I love the elbow macaroni in this. Reminds me of my childhood. As do the pork chops. Looks like a great dish. YUM! This looks like total comfort food. I love the lead picture! Adapt or die……and you were not prepared for the first option. You did well with your version and I actually prefer my chop whole…I like eating off the bone!!! I love the ‘adapt or die’ comment, Nina ;-) I agree about eating chops off the bone — that’s exactly what I did. A great dish for two & probably easily adaptable to whatever we have in the fridge as well. Allen, this looks fantastic! And you are right…never see those beautiful trees in Los Angeles! Lucky you! Oh, I love this idea. I have made the type of goulash you talk about with the ground beef, at least a million times. I’ve never thought about using pork chops. My husband will smile when I present this! Thanks for another great great post, Allen. Wow! This is quite the hearty one pot meal. Looks great. I’ve only ever had goulash once- when I was in the Czech Republic, no less- and it was pretty good, but you have gotten me craving hard for these, screw authenticity! I bet Joe enjoyed them a lot! We grew up with goulash as well, but it certainly wasn’t as appealing. I love the baked pork chop and the fact that it was baked, not stove top like I was use to… I might have to revive the goulash and try your twist. I never have had authentic goulash, but it seems as if I’m familiar with all those ingredients! I haven’t met a pork chop I didn’t like. Looks yummy! I made this last night and it turned out great! By the way, I am from Vancouver and I apologize for all the rain. Being of Romanian descent, I am cooking this one! It looks so very delicious. I am happy I stopped by. Headed to the store now!